Dr Maria Demeterova is a nutritionist from the Kosice Veterinary University of Czechoslovakia. She is lecturing at the Veterinary Faculty of Eduardo Mondlane University, Maputo, under a bilateral cooperation agreement between Mozambique and Czechoslovakia. Dr C. Lopes Pereira is an epidemiologist and Mr A. Crisanto Dade a technician in the Veterinary Faculty. The authors'address is Veterinary Faculty, PO Box 257, Maputo, Mozambique. In developing countries the vast majority of rabbits are produced under small-scale or backyard systems. With recent production systems, rabbits are capable of supplying meat in reasonable quantities with relatively low levels of inputs. Performance levels achieved in developing countries have been discussed by several authors but only limited data are available on medium- and large-scale production of rabbits (more than ten females in tropical developing countries). The study of performance levels is essential for evaluating the feasibility and the systematic progress of these systems. Furthermore, accurate record-keeping is indispensable for the detection and solving of problems This article discusses the progress achieved in the performance levels of a rabbit farm which started with 27 breeding females. The production of rabbits in Mozambique has faced various constraints, resulting in low productivity and high mortality rates among young animals. With an initial group of 27 breeding females of a low overall rate of productivity, the production unit in question was managed over a period of two years and production data collected and analysed. During the study period, the colony increased from 42 to 402 animals and the conception rate increased from 54.7 to 90.1 percent. Although the number of live-born sucklings per doe (6.3 in 1987 and 7.3 in 1989) did not increase significantly, the average number of sucklings born per female increased considerably over six months (7.7 in 1987 to 13.8 in 1989). The mortality rate up to weaning decreased by 54 percent. The conversion ratio achieved at the end of the study period was 3.47 kg of concentrate and 6.5 kg of forage per kilogram of liveweight in growing rabbits, reaching a final weight of 2 kg at three months. With a mixed feeding system, the feed conversion efficiency of the farm was 5.27 kg of ration per kilogram of rabbit sold. The results were principally brought about by controlling reproduction, especially by allowing long intervals between parturitions; quality and adequate management of feeding; the reduction of environmental stress, mainly from the effect of temperature and humidity; and health care consisting mainly in the control of intestinal coccidiosis. 1 (DM = Dry matter; CP = Crude protein; CF = Crude fibre; EE = Ether extract: NFE = Nitrogen-free extract). Results were compared with those reported by other authors and new management inputs were suggested to increase productivity. The faculty's farm provided the population under study, composed mainly of California and New Zealand White as well as their crosses and a third group of an unspecified local breed. 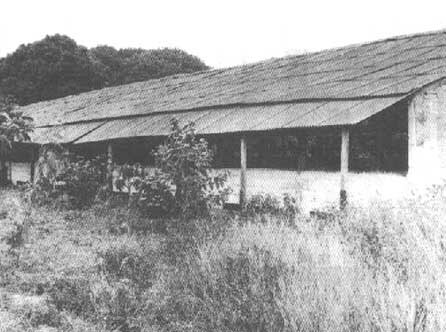 The total number of animals was 42, all in a bad nutritional state, and they were housed in a single-level wire-floored system. A lack of concentrates and rations, together with the improvisation of management, were the main problems. The animals were fed mill by-products (maize and wheat bran) and low-fibre rations for poultry combined with forages such as Pennisetum purpureum, Panicum maximum, Leucaena leucocephala and leaves of Ficus elastica. For reproduction, the traditional method was used and the rabbits were weaned at 42 to 45 days, with the females mated the following day. Confirmation of conception was carried out after 15 days and the service repeated if necessary. In the past, data had been incorrectly collected and record-keeping had not been satisfactory. In addition, supervision and control were irregular and insufficient. In 1981, mortality rates in the same production unit up to weaning were 26.6 percent and in adults 27.4 percent (Harun and Zacarias, personal communication). · The part-time assignment of one medium-level technician to supervise the daily work of the personnel. · Special attention was paid to record-keeping; every female was registered and her productive and reproductive life recorded; all spending and returns were accounted for. · A prophylactic plan was established, including specific measures for the prevention and control of coccidiosis; the control of mange; and environmental hygiene (disinfection of cages and equipment and rodent control). The animals were maintained under the same housing conditions and the ad libitum feeding of mill by-products and green fodder was continued. 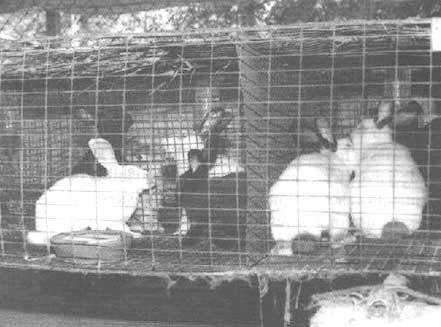 At the end of the first year, the situation improved and a commercial ration for rabbits (with a low-fibre and high-energy content) was used. This was supplemented by green fodder as previously given and by leaves of various trees and shrubs such as Mangifera indica (mango tree), Morus nigra (black mulberry), Ipomoea batatas (sweet potato) and Dolichos lablab (lablab). Fresh water was available daily. The nutritive values of all the feeds used are shown in Table 1. To improve reproductive performance, females were selected and culled according to: individual conception rates (after more than three unsuccessful services); the number of rabbits born (less than five); predisposition to abortion; and bad mothering. The females excluded were replaced by others from the production unit, which were serviced for the first time at five months of age. During the study period all old females were culled and replaced. The traditional mating system was used. Does were mated 42 days after parturition and one day after weaning. Breeding bucks were introduced from outside the unit. Newborn rabbits were protected from the cold in the coldest months and rodent control was practised when necessary. Temperature and humidity data were obtained from the Meteorological Institute of Mozambique. The colony structure and numbers, mortality, reproduction (conception and fertility rates, litter size at birth, rabbits born per female) and production were analysed and compared at intervals of six months and one year from the beginning of the study. Data were collected over a period of two consecutive years (1987 to 1989) and analysed by computer. Evolution of the herd. 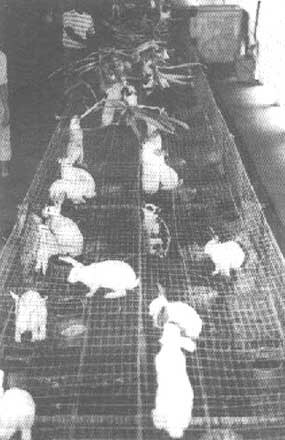 The continuous improvement of management and feeding contributed to the increase in the total number of animals from 42 at the beginning of April 1987 to 402 by the end of March 1989, with an increasing number of rabbits sold. The data by semester and year are summarized in Table 2, and over a two-year period in Figure 1. Mortality. At the beginning of the study, a mortality rate of 18.75 percent was found in the group of animals up to weaning (42 days). It decreased to 6.99 percent in the second year (see Fig. 2 and Table 3). The mortality rate of growing animals did not undergo important changes throughout the study period (3.3 percent to 3.4 percent). The relationship between temperature and mortality in sucklings (1 to 45 days old) is shown in Fig. 3 where mortality is shown to relate to the extremes of temperature in the first year but not in the second. Table 3 also shows the results obtained in reproductive parameters during the study period. The conception and fertility rates increased respectively from 54.7 percent and 48 percent in the first semester to 90.1 percent and 88 percent in the last semester observed. Although the number of live-born rabbits per female did not increase considerably (six in the first year and seven in the second), the number of rabbits weaned per parturition increased from 3.9 in the first year to six in the second. Similarly, the number of rabbits weaned per female increased from 11.1 in the first year to 22.2 in the second. The number of parturitions per doe per year increased from 2.9 in the first year to 3.7 in the second. In the second year, the weight of females at first mating was 17.3 percent greater than in the previous year. The liveweight of sucklings at weaning increased from 459 g in the first year to 749 g in the second, which represents an increase of 63.28 percent. The weight of 2 kg was achieved at 90 days instead of 135 days in the first year. The number of animals sold in the first year was 179 while 571 were sold in the second year. This represents an increase from 6.4 to 16.1 of animals sold per female per year. Feed conversion efficiency was improved from 12.91 to 5.27 kg of ration per kilogram of rabbit sold. The conversion ratio in growing animals was 3.47 kg of ration and 6.5 kg of green fodder per kilogram of liveweight. The improvement in performance indicators is shown in Table 3 and Fig. 4. The importance of management in minimizing stress factors in rabbit production was emphasized by Camps (1984) at the 3rd World Rabbit Congress. Suitable environmental conditions, management, hygiene and adequate nutrition and feeding are vital in rabbit production. In tropical zones one of the most important stress factors are high temperatures (30 to 35°C) which have a deleterious effect on production (Lebas, 1983). The combination of high temperatures and high humidity is responsible for a number of important changes in the normal physiology which gives rise to low productivity and anoestrus (González, 1975). These facts were confirmed in our study and, in addition, it appears that the same factors are related to the increasing number of abortions and high mortality in young animals during the peak of the hot season. Low temperatures, on the other hand, had a considerable negative effect on the survival rate of newborn in the first year while better protection against wind and cold decreased mortality in this category. 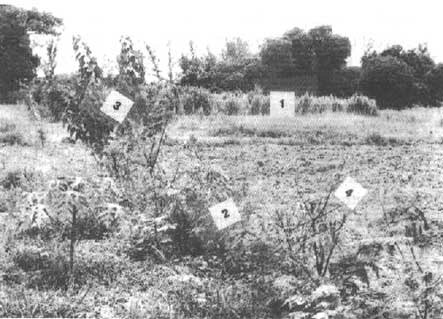 Predation by rats was also an important cause of losses. Rodent control contributed to lower losses in the second year. The mortality rate of 6.99 percent achieved in the second year is lower than that reported by Maertens and Okerman (1987),Rodriguez (1981, cit. De Blas Beorlegui, 1984), Mendes and De Blas Beorlegui (cit. De Blas Beorlegui, 1984) and Harun and Zacarias (1981, personal communication). Mortality in growing rabbits (between weaning and three months) was mostly due to coccidiosis, and Owen (1981) emphasized the role of high temperatures and humidity in increasing the susceptibility to this disease. Although lack of fibre is considered to be a contributing factor to the occurrence of diarrhoea and coccidiosis (Laplace, 1975, cit. 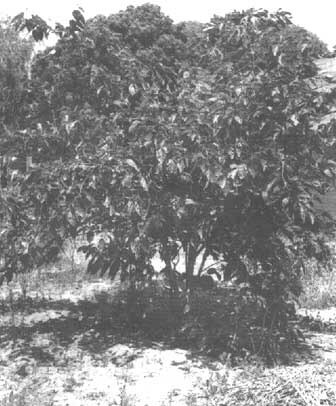 De Blas Beorlegui, 1984), this cannot be considered in the present study because pre-dried (12 hours) green fodder was available ad libitum and thus covered the fibre requirements. The mortality rate in this group did not change throughout the study period because of the systematic use of a coccidiostatic mixture of sulfaquinoxylein and diaverdin. The number of rabbits born alive and weaned per parturition in the present study is higher than that recorded by Pavesi (1985) in Mozambique and El Amin (1978) in the Sudan, but lower than the results reported by Maertens and Okerman (1987) and Mendes and De Blas Beorlegui (cit. De Blas Beorlegui, 1 984) under European conditions. Using the traditional system, 24 to 27 days were lost between consecutive parturitions. This could be substantially improved and an approach to the extensive system with the first service taking place 25 days after parturition could be implemented, thereby raising the number of parturitions from the present 3.68 to about 6.5 and, consequently, improving all the other related performance indicators. This performance could be achieved with the present feeding system provided the level of crude protein in the diet is strictly maintained at 18 percent. Lebas (1983) reported 50 to 60 rabbits sold per year per female in well-managed rabbit farms in Europe, with a feed conversion efficiency of 3.6 kg of ration for 1 kg of liveweight sold. 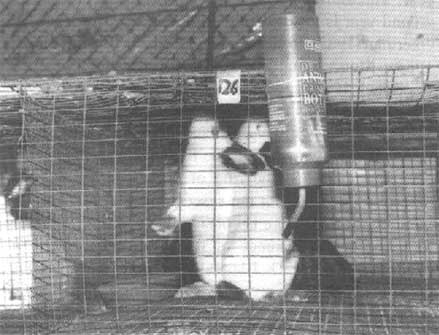 The same author considers the production of 15 to 20 rabbits per year to be acceptable in countries such as Côte d'Ivoire, Gabon and Mozambique. In the second year of the present study, 16.1 rabbits were sold per female with a conversion efficiency of 5.27 per kg of liveweight sold. This feed conversion efficiency is indirectly related to the underutilization of the does' reproductive potential. The liveweight of rabbits (749.41 g) at weaning after 42 days of mixed feeding is greater than that reported by Ramchurn (1978) using a 100 percent commercial diet in Mauritius. The results published by El Amin (1978) and Mendes and De Blas Beorlegui (cit. De Blas Beorlegui, 1984) for the same age are lower than those reported here. Based on his experience, Owen (1981) referred to the possibility of reaching 2 kg of liveweight at six months of age in tropical countries, without a high-energy and highprotein diet. Using a mixed feeding system, the same weight was attained at three months. This result is comparable to that observed by the same author in the United Kingdom, where meat rabbits achieved slaughter weights of 2 kg at 2 to 2.5 months. · a monitoring system with quantitative measurements to assess health and performance indicators continuously. Camps, J. 1984. El manejo en cunicultura. Relación con la higiene, con resultados, con "stress" y con la etología. Proc. 3rd World Rabbit Congr., Rome, p. 9-39. WRSA. De Blas Beorlegui, C. 1984. Alimentación del conejo. p. 36-37; 79-80. Madrid, Ediciones Mundi Prensa. El Amin, F.M. 1978. Rabbit husbandry in the Sudan. Proc. Workshop on Rabbit Husbandry in Africa, Morogoro, Tanzania. p. 29-42. Stockholm, IFS. González, L.G. 1975. Cunicultura tropical. La Habana, Instituto Cubano del Libro. pp. 338. Lebas, F. 1983. Small-scale rabbit production - feeding and management systems. World Anim. Rev., 46: 11-17. Maertens, L. & Okerman, F. 1987. Reproduction, croissance et qualité de carcasse; possibilités d'un rythme de reproduction intensif en cunicultura. Revue de l'Agriculture, 5: 1157-9. Owen, J.E. 1976. Rabbit production in tropical developing countries: a review. Trop. Sci., 18: 203-210. Owen, J.E. 1981. Rabbit meat for the developing countries. World Anim. Rev., 39: 2-11. Pavesi, M. 1985. Potencialidade da criação cunícola em Moçambique. Seminario de Produção Animal. p. 127-148. Maputo, Ministry of Agriculture. Ramchurn, R. 1978. New feed resources for rabbits in Mauritius. Proc. Workshop on Rabbit Husbandry in Africa, Morogoro, Tanzania, 1978, p. 129-135. Stockholm, IFS.